Welcome to the climate apocalypse delusion, courtesy of the card-carrying apocalyptics of the US DOE National Laboratories, and legions of other job-security-conscious academics, “scientists,” journalists, politicians, and intellectuals. We must believe that climate apocalypse is real, since the mass milieu tells us it is so — against all credible evidence. Another popular delusion floating within the bubble of the mass milieu is the “Peak Oil Armageddon” delusion. This fashionable delusion has been recently challenged by an extended period of low oil prices — stemming from a combination of higher supply and lower demand. … nearly 80 percent of the world’s oil reserves are in the hands of government-owned companies. It’s not too far-fetched to believe that with the benefit of more knowledge and modern technology, the combined additional production from Libya, Iraq, Iran, Russia, Nigeria, Venezuela, South Sudan, and Mexico might amount to an extra 10 to 15 million barrels per day. … world oil production increased from 77.6 million barrels per day in 2003 to 86.8 million barrels per day in 2013. [Michael] Lynch’s book The “Peak Oil” Scare and the Coming Oil Flood, scheduled for publication in spring 2015, predicts even larger leaps in the global production of crude. Lynch thinks world oil production will increase to around 110 million barrels per day during the next decade. In the meantime, global oil prices will oscillate around $60 per barrel and could conceivably drop to $40 per barrel within five years. I asked Lynch if this meant oil markets might be in for a replay of the price collapse that occurred in the 1980s. He replied that he thought so. In inflation-adjusted dollars, the price of oil reached its peak annual average of $106 per barrel in 1980 and then collapsed to an annual average of $30.80 per barrel in 1986. It should be pointed out that Saudi Arabia shows no sign of slowing its oil production — despite the price slump. Russia’s Soviet-era oil-production infrastructure is showing signs of age, however, and unless the bear can rope in some technologically savvy foreign partners, Russian oil production is apt to decline over the next few years. Russia’s declining oil infrastructure is not “peak oil,” but rather peak stupidity, corruption, and criminality in high places. The decline of Russia’s global significance is reflected in a collapse of human infrastructure, in education, science, engineering, public health, and in critical infrastructures of housing, transportation, domestic energy distribution, and law enforcement. Economic security is collapsing inside Russia, and the future seems very uncertain. Russia had best start making more friends if the bear wishes to maintain a habitat for itself — even a shrinking habitat. Advances in Drug-Delivery Gels This technology offers the future of multi-drug extended release formulas from a single injection. Counter-productive renewable energy subsidies are delaying a larger movement to more reliable nuclear power (via Dan Yurman) One of the many dangers of the “green energy delusion:” Resources are wasted on unreliable, intermittent energy so that they are not available to build more reliable long-term energy infrastructures. Did some of your distant ancestors step off this rogue star? 70,000 years ago is not that long, in geological terms. We know that the brighter fraction of humanity shares some DNA with Neandertals. So why not include “starmen” into the genetic mix as well? The timing sounds right . . . 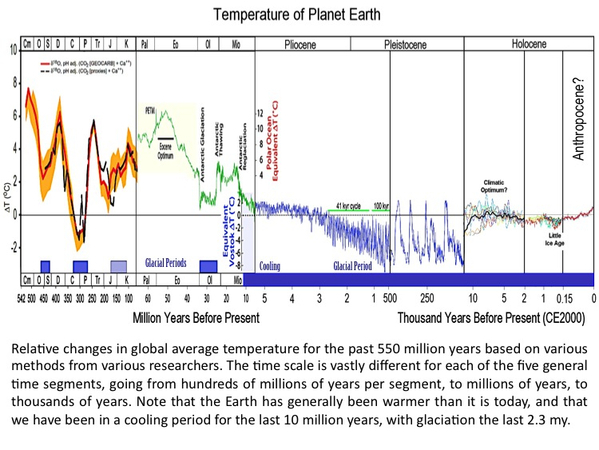 Note about the graphic from Lawrence Berkeley Lab at the top of the page: Almost all of the temperature data was derived from “proxy” measurements, with just the tiny red bit at the end based upon actual temperature measurements — which have gone through an endless series of upward “adjustments” since the time of actual measurement. In other words, the graphic is a public relations stunt rather than a scientific data display, since it amounts to a pastiche of varied methods of attempting to approximate global temperatures. We can be sure that this planet is naturally cold, naturally hot, and naturally anywhere in between. And we can be sure to guard our wallets and our independent rationality whenever politicians, journalists, or politically influenced “scientists” cook up opportunistic grand schemes that will allow them to accelerate an already-ongoing loss of personal freedoms and options. This entry was posted in China, Climate, Peak Oil, Russia and tagged Climate Apocalypse, Ice Age. Bookmark the permalink. George Riesman (might be spelled wrong), besides writing some great commentary on economics talked about the environment and global warming, environment was would you rather live in a hut without air-condition or on the slim chance that we could raise the temperature a couple of degrees live a house with A/C, the other was on resources and just started doing the math of how big the planet was and how little of it we have touched, and the fact that we could go many thousands of years before we ran out of anything. George Reisman’s Blog on Economics, Politics, Society, and Culture is one website you may be referring to, and Capitalism.net may be another. Julian Simon’s Ultimate Resource II is a book on resource economics that we often recommend here. Bjorn Lomborg is another economist who insists upon inserting facts and rationality into a debate that is too often dominated by emotion and groupthink. Unfortunately I am a reader and not a very good writer, but yes his blog sites are very good and his capitalism book and lectures are also good. The one on resources used came out of Mises site when he was writing more for them. Truly enjoy your pessimistic/optimistic writing but miss the science stuff from the old blogs.